Note: Each double yarn over is treated as two stitches in the following row. Cast on 21 stitches and knit one row. Row 1: Sl1 wyif, k1, yo, k2tog, k3, (yo) twice, k2tog, k12 (22 sts). Row 2: Yo, k2tog, k12, p1, k4, yo, k2tog, p1. Row 3: Sl1 wyif, k1, yo, k2tog, k18. Row 4: Yo, k2tog, k17, yo, k2tog, p1. Row 5: Sl1 wyif, k1, yo, k2tog, k3, [(yo) twice, k2tog] twice, k11 (24 sts). Row 6: Yo, k2tog, k11, p1, k2, p1, k4, yo, k2tog, p1. Row 7: Sl1 wyif, k1, yo, k2tog, k20. Row 8: Yo, k2tog, k19, yo, k2tog, p1. Row 9: Sl1 wyif, k1, yo, k2tog, k3, [(yo) twice, k2tog] 3 times, k11 (27 sts). Row 10: Yo, k2tog, k11, p1, k2, p1, k2, p1, k4, yo, k2tog, p1. Row 11: Sl1 wyif, k1, yo, k2tog, knit to end. Row 12: Yo, k2tog, k22, yo, k2tog, p1. 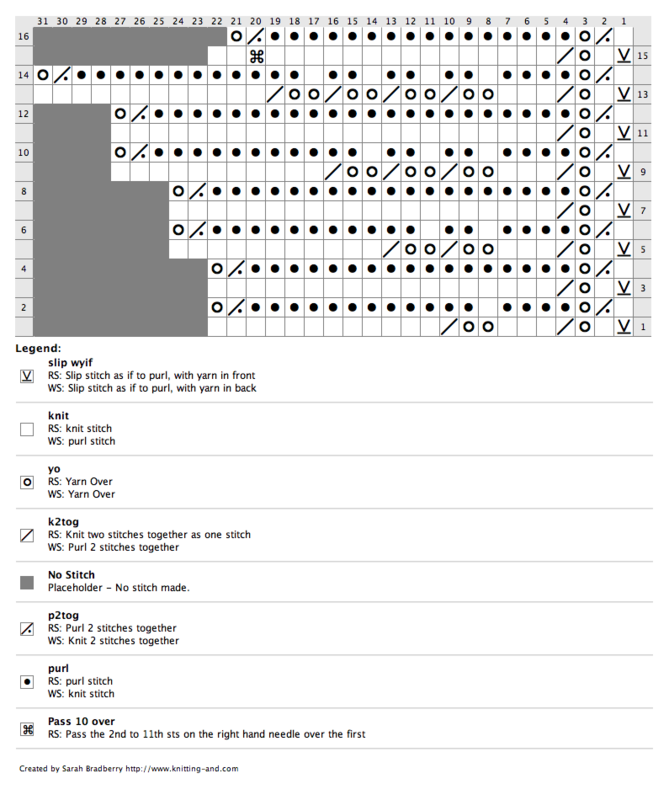 Row 13: Sl1 wyif, k1, yo, k2tog, k3, [(yo) twice, k2tog] 4 times, knit to end (31 sts). Row 14: Yo, k2tog, k12, p1, k2, p1, k2, p1, k2, p1, k4, yo, k2tog, p1. Row 15: Sl1 wyif, k1, yo, k2tog, k15, pass stitches 2 to 11 on the left hand needle over the first, k2 (21 sts). Row 16: Yo, k2tog, k16, yo, k2tog, p1. 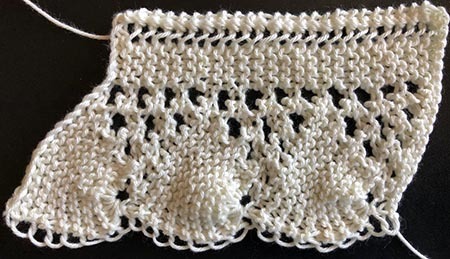 Repeat rows 1 to 16 for the desired length. Cast off. Copyright Sarah Bradberry, 12th February, 2018.